Bangkok is pretty much on anyone’s list when it comes to places to travel to in Thailand. Even if you're just staying for a weekend, you have about a few thousands places to stay ... so which hostel or hotel do you choose? That’s where our volunteers who live in Thailand for a semester come in (thank you ILP Thailand volunteers!). 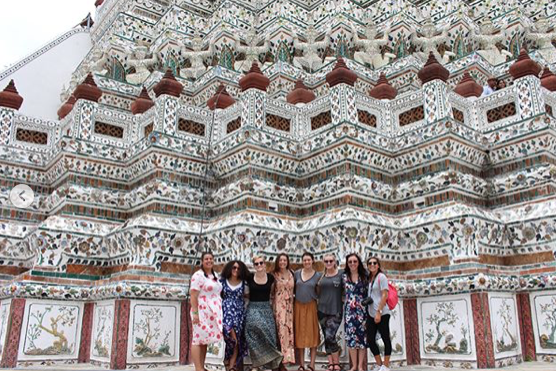 Every ILP volunteer has vacation time and every weekend off, so it’s pretty much a guarantee that a trip to Bangkok will happen at least once during your semester, maybe even twice. you might want to know more about volunteering in Thailand. 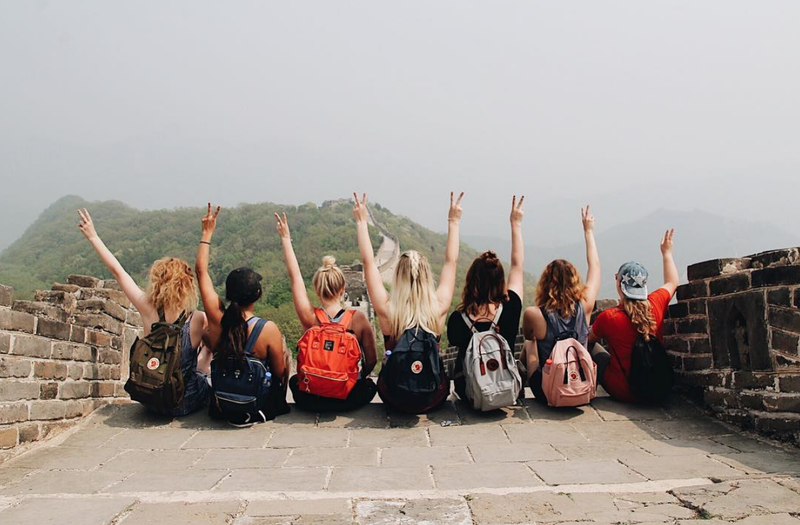 Our volunteers are college-aged, and usually with a college budget, but in Asia, just a few dollars can get you a pretty nice place to stay. We’ve quoted some price points, but understand these may change without warning, and often fluctuated if you’re traveling in the high season and over a holiday; please check prices before you book. Each one of these spots come recommended by volunteers (plus you can read the Hostel World reviews for more info). We even have a bit about those dreamy hotels that have a rooftop pool to swim in if you are feeling a bit spendy. We’ve included a price range next to a bit about the hostel, and have a link for booking. Since this city is so huge, we also outlined how far each hostel is from the Grand Palace, which is absolutely something you should see, to just give you an idea of where these places are. We have had several ILP groups stay here and love it. Volunteers have commented on a helpful staff that helped them book a tour to the floating markets, plus this place has free breakfast which we all love. Good One Hostel also has a cool area to hang out up on the 7th floor and other services (like a laundry service). This hostel is about a 15 minute cab ride to the northwest to reach the Grand Palace. Dorm beds are around $11, with private rooms around $35 (sleeping 2). 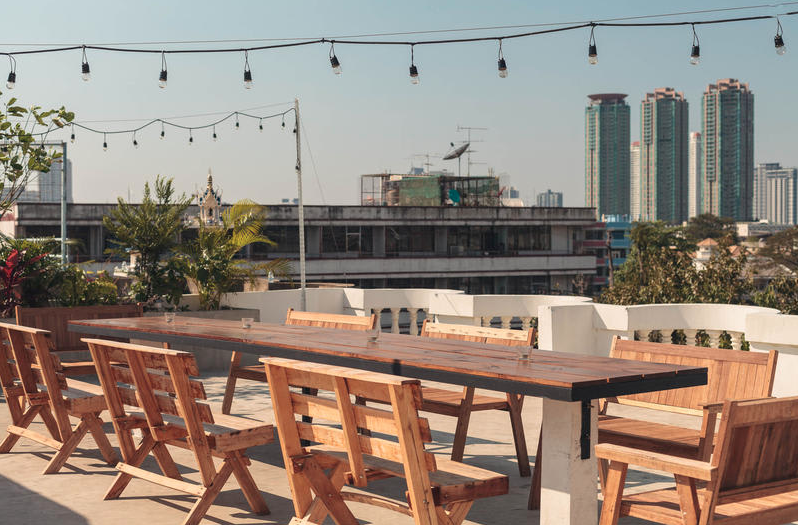 Yim Yam hostel is a pick for volunteers looking for a spot with good location, helpful staff and a free breakfast (that’s the real deal maker right there). Yim Yam also does a free brunch on Sundays. This hostel is right by the skytrain which can help you get around the big city, and they have an English speaking staff to help you out even more. To help you out, it’s about an 11 minute taxi ride from the Grand Palace, heading west. Dorm beds are around $13 - $19, with private rooms sleeping 2-4 are more like $33 - $85 a night. “AMAZING! !” is how one ILP volunteer described this hotel. Niras Bankok Cultural Hostel comes very highly rated on Hostelworld, with travelers all over mentioning it's great location, and really helpful staff (also, another spot with free breakfast, though you will have to pay for hot drinks). It has a cool, Old Bangkok vibe we’re also in love with. Find this hostel about 6 minutes away (via taxi) from the Grand Palace — It’s directly west of this tourist hot spot. Dorm beds are about $13 a night, with private rooms available for up to 4 people for $70. Find this gem with easy access to the MRT and the skytrain, and feel like family with the family-run staff at Analog Hostel. Minimalist and modern, the decor has some antique twist (and you may catch a glimpse of the cute dogs that also calls this place home). Two pups live on the first floor and are as cute as can be. Take a 25 minute taxi ride to the west to reach the Grand Palace from this hostel. Dorm beds are around $12 -$15 per night, with some private rooms that sleep up to 6 for $80. Complete with cute decor and a fun hang out area, Oldtown Hostel is another place our ILP volunteers would recommend staying at. It’s a 10 minute walk to the main transportation hub and a 15 minute walk to a cool food street, which we’re not mad about. Head north west and hit the Grand Palace in about 11 minutes by taxi from the Oldtown Hostel. Prices are lower than others, around $7-$8 for a dorm bed, and family rooms (which sleep for) are under $40. Hang out in Bangkok’s Chinatown with a stay at the Pop Art Hostel. It’s a cool place to stay to get a different taste of Bangkok’s neighborhoods, for a really good price. As a head’s up, most beds in Asia tend to be really firm, and past guests at this hostel have mentioned having particularly hard beds, but the really friendly staff and cool hostel (and cheap prices) may make up for that. Find this hostel 10 minutes via taxi away from the Grand Palace (if you’re heading west). Get a dorm room spot for under $5 (some rooms are a few dollars more. Artsy and modern, this place feels a bit more like a hotel than a hostel. Kama Bangkok is described as a boutique and breakfast place if that gives you an idea of what staying here is like. You’ll get bigger rooms (that guests say are impeccably clean and maintained), but it is a bit far away from most things you’ll be seeing in the city ... but we love their rooftop terrace! Heading north, it takes about 20 minutes to reach the Grand Palace by taxi from this hostel. Dorm beds are priced around $8, and private rooms that sleep 2 are anywhere from $32 - $46. 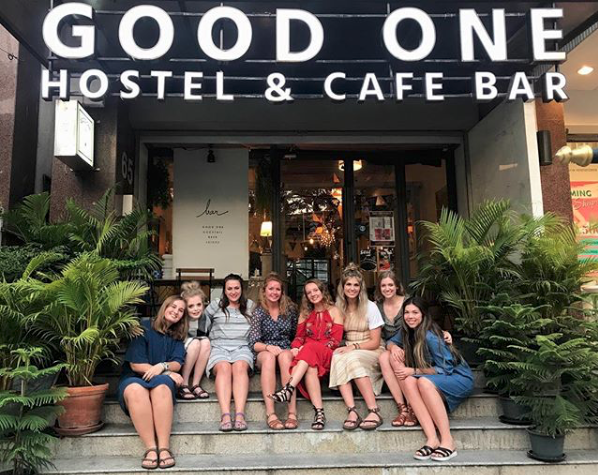 ILP volunteers aren’t alone when they mention that the owner of this hostel makes the stay (here’s what one ILP volunteer said about Chan Can La 99 Hostel: “The lady (Annie) who owns it is the sweetest! … and it’s right next to the sky train”. Love it. Annie goes out of her way to make sure you have a wonderful time in Bangkok, whether that’s mapping out what you should see, expected prices when it comes to tuk-tuks, and more. She goes above and beyond for her guests! We love how helpful Annie is, just know it is about a 30 minute taxi ride to the Grand Palace (heading north west). Dorm beds are priced at around $11, with double rooms around $23 and 4-person private rooms for about $46. This place is cute and clean, with bright blue and white walls and a huge common room where you can hang out and meet other travelers. It’s a calming atmosphere which creates a nice break from the loud and very busy city of Bangkok, so if you need a bit of a relaxed place to stay, Ease Hostel is a good fit. It’s also right next door to Wachirabenchatat park. Dorm beds are anywhere from $12 to $18 per night, with private rooms (for 2 people) range from being $27 or $40 a night. Ease Hostel is north east of the Grand Palace; about a 20-25 minute drive. Fun and vibrant, Live It Up Asok is also very conveniently located by a handful of transportation spots, with the BTS and MRT right outside. Past guests mention that the door to this hostel is not on the main drag, but down one of the alleys, so be sure to follow signs to help you find your way. This is another favorite place to stay, according to our ILP volunteers (also, be sure to visit the Terminal 21 food court; it’s just a couple minutes away by walking and has some great places to eat. Dorms are $10 - $14 a night. Get private rooms (sleeping 2) for $27 or $37 a night. In a taxi, you’ll drive west to hit to Grand Palace and get there in about 22 minutes. It’s not a hostel, but we have had some volunteers stay at the 4-start hotel, Galleria 12. It’s a pretty luxurious and lovely place to stay if you want to spend more than $12 for a dorm bed. If you’re really looking for a bucket list adventure, you can hang out and grab dinner above the pulsing city of Bangkok at a rooftop restaurant, or take a swim in one of their rooftop pools. 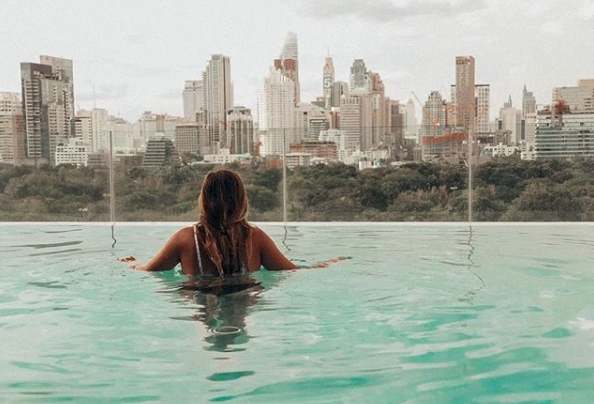 Most hotels need you to be a guest at the hotel in order to use their pool, but we have our favorite recommendations below if you’d like to make that happen (just look at the picture from So Sofitel … you are going to want to make that happen). Take a dip in this pool, that's only a few dozen floors up from Thailand's capital city at the Bangkok Market Hotel Sukhumvit. Their rooftop pool is for guests only, but does give you a dizzying view of surrounding skyscrapers. Nightly rates range, but you can find a few rooms for $180+ USD (these can be shared with 1-2 other people to help lower the cost). Swim amongst the skyscrapers by staying at the So Sofitel Bangkok hotel. Being a guest here means access to their top tier pool, which gives you a whole view of Bangkok spilling out below you at dizzying heights. You can get a variety of rooms, but one option sleeps three and is about $150 USD per night, but you can spend triple that if you upgrade to more luxurious suites. This hotel is a 15 minute taxi ride to the Grand Palace (it sits south east of this tourist spot). Dying to take a dip in one of these pools, or spend a weekend (or two) running around Bangkok?